For the Botanicarum. Some details to tweak but a quick shot at night and another in daylight. All of 30minutes to paint so far. One of those simple quick models that I’ve ended up really liking. This might just be something I’m not really thinking about as I type it, but this is my favourite model so far. I’m not even sure why but the simplicity and general peacefulness really works for me. Yes. We hope to make a host (or a hundred) models like this. Simple, calm cogs in the huge machine that is Terra. That’s going to look amazing if they’re all to this standard. I’ve only only just noticed the chlorophyll stains on his arms, a wonderful detail.. I love it too. That is one hell of a gardening servitor. Great! What I like is the contrast between the very ordinary coat he wears and the very fantastical and intimidating limbs and face. One starts to wonder if there’s any man left at all. 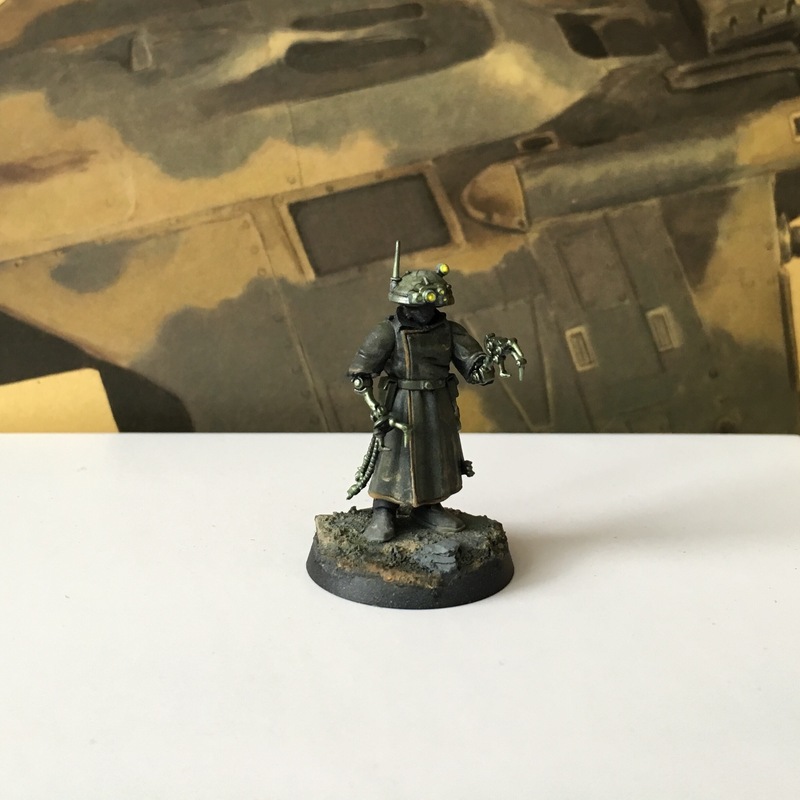 I have no idea how you managed to paint that in 30 minutes, I struggle several evening with a face (granted this miniature doesn’t have one). Either way, you’ve clearly created a style of your own, very much apart from the ‘Eavy Metal paradigm. I think it’s actually closer to the style seen on the collectible figurines by Weta and Sideshow. Thanks 🙂 I think this one is all machine. Left with his buddies for thousands of years to maintain the now forbidden Botanicarum. He has picked up his dead masters jacket and boots and now leads the machines to care for the fauna like his master a millenia ago. Absolutely remarkable. This figure really does sing with the beauty of simplicity, it’s like a candid snapshot of an everyday moment in the Imperium captured in miniature. 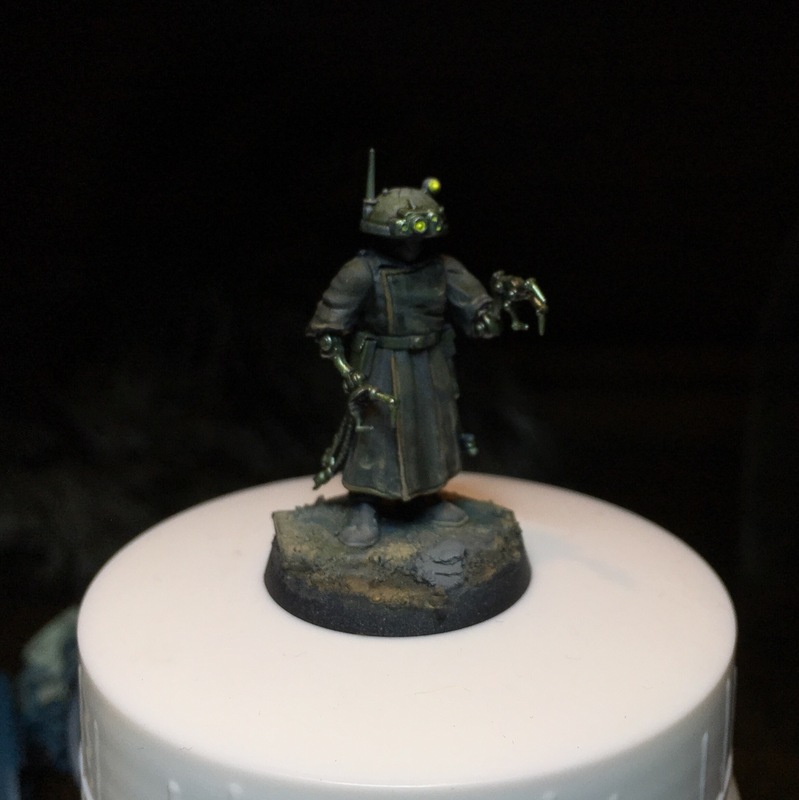 spot on gardener of the 41st millenniumme – lovely mini ….. the green lights are so creepy …. Thanks 🙂 even the metallics are green! This is yours with his friend when the friend is ready. Such a lovely miniature. I’ve also been admiring your bases. I may have to try to copy them for my new project. I constantly tweak and change them. For this project the bases are really little studies of different areas of the table and how I intend to paint them. So simple and yet so cool! Great work. Suitably creepy, and at the same time it has a nice calmness about it. Pose, bits, everything. He is waiting for his new masters with Wall-E like fondness. Very simple – very effective! Brilliant model, Migs! So simple yet so much character. Love this character; so simple yet there’s so much there. Really ingenious miniature this, Migs. Beautiful conversion. Totally perfect! Such a simple and elegant conversion but so powerful. The subtle paintwork and naturalistic base give it a feeling very unlike most 40k models — reminds me more of the high-end of custom Japanese modeling. I assume the Espartic Wall is part of the Imperial Palace, maybe in the region once known as Sparta? Apparently ‘Emperor Expects’ also includes lots of info on life on Terra. I’ll try to dig through it ASAP!